On December 15, 2018, the tax office mailed out the Honolulu County Tax Assessment Notices. The combined assessed property values in Honolulu County increased by 6.8% compared to last year. That includes Oahu homes, and condos, as well as newly completed Kakaako condos. An increase in value might make you feel good. But what if the assessed value of your property is higher than the real market value? Could the tax assessor have made a mistake and over-assessed? Would you want to pay more property taxes than you should? Of course not. The good news is you can appeal your property tax assessment. Before we discuss who could and how to appeal, let’s understand how the assessed value gets established. Unlike California’s Prop 13, all Honolulu County (island of Oahu) properties get assessed once every year on October 1st based on comparable sales that have recorded between October 1st the prior year through June 30th the current year. 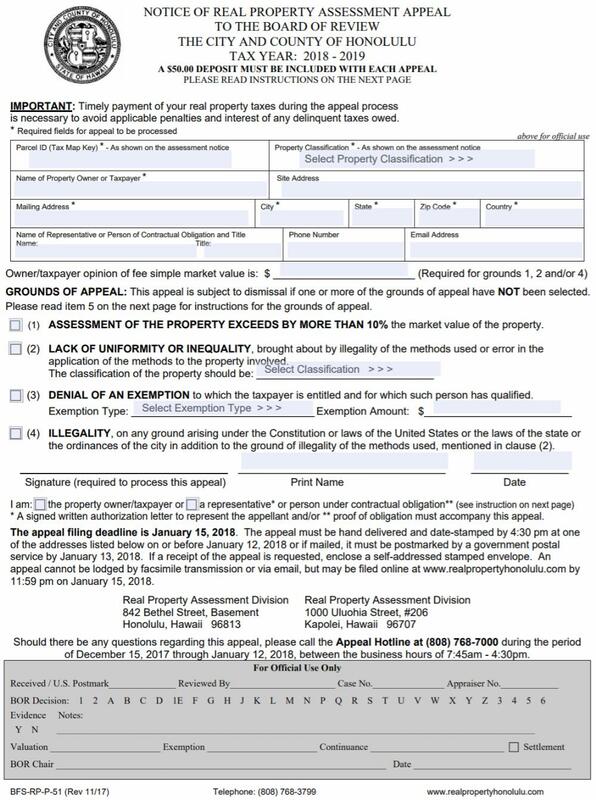 Property owners receive their October 1st assessment notice as early as December 15th. The new assessed value will be used to calculate the property tax for the following fiscal year starting July 1st. The point of contention is the accuracy of the assessed value. A discrepancy of $500K in assessed value translates into a difference of $1,750/year (w/ 0.35% residential tax rate) or $6,450/year (w/ $1.29 resort tax rate). The tax assessor never sees your property and any of the comparable properties! The assessor might not realize how your property differs from a comparable sale that otherwise on paper looks similar in size and age. 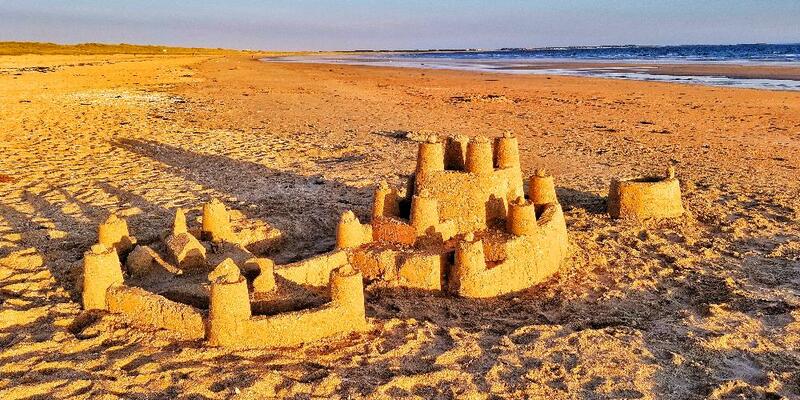 1) Your home #A might be located along the busy highway one lot away from the beach without an ocean view. A recently sold comparable home #B next door might be of similar size and age but is located one lot away from the busy highway and directly on the beach! Your home #A might be worth $1Mill because of the busy highway. The recently sold comparable home #B could have fetched $3Mill because of the superior ocean front location. That is a whopping $2Mill difference in real market value! 2) Similarly, in a condo building, your condo #A might be on the noisy street side next to the smelly dumpster at the loading dock with no ocean view. A similar size condo #B on the same floor but on the ocean side with unobstructed views might have recently sold for $500K more than what you would be able to sell your condo at. The tax assessor would not know the difference and assess both condos similar even though the real market value for both properties is far apart. In both cases, property #A has the inferior view and location and has been unfairly assessed significantly above the real market value. Perhaps the assessor used seemingly similar comparable sales unaware that they are superior and more valuable. You should appeal if you can show supporting evidence that the tax assessed value of your property is higher than the real market value. The tax assessor reserves the right to be off by 10%! Any smaller discrepancy in the tax assessed value might not be sufficient to convince the tax assessor to adjust the assessed value. But as in the two examples above, I have seen discrepancies where the assessed value can be 20% or 30% (!) higher than the real market value. Do you want to lower your tax assessment because a) it is unfairly above the real market value as described above, or do you want to lower your tax assessment because b) you can, by using inferior comps and arguing they are comparable to your property? Let’s assume you own the more desirable and more expensive property #B in either one of the above two sample scenarios. Now, your property #B has the superior view/location and is assessed accordingly perhaps close to the real market value. But recent comparable sales, although less desirable with inferior view/location, sold at a lower price than the assessed value of your property #B. Could you, or should you, appeal your property assessment simply because inferior comparable properties sold at lower prices than your tax assessment? 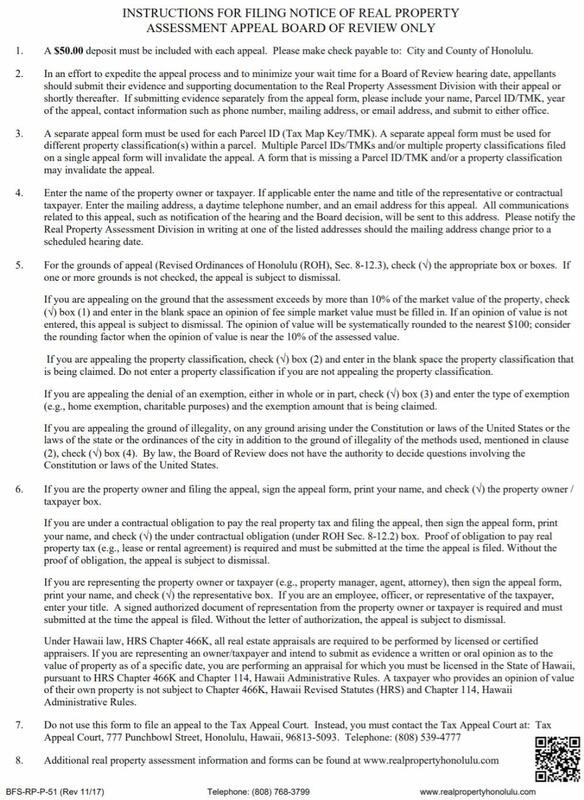 In other words, the assessed value for your property #B might be at real market value but you don’t feel like paying more property taxes than what the inferior properties will have to pay. With you having the knowledge edge, the tax assessor might not be able to accurately establish the real market value to disprove the validity of your appeal. In that case, you could appeal, but should you? – That is more of a moral question. You may download a copy of the application to appeal form BFS-RP-P-51 here. You may also call the Appeal Hotline at (808) 768-7000 with questions or concerns before the January 15th deadline. – Good luck!